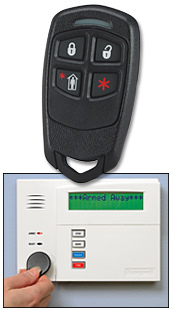 Keyfobs that can allow you to turn your alarm system on or off with a single push of a button, similar to a car alarm keyfob. 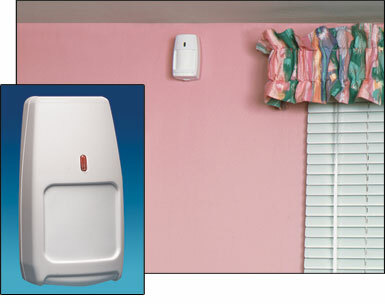 They can also have a panic button to notify the authorities of a medical or other emergency. Additional keypads and/or upgrade to custom English description keypad. Smoke detectors which will call the fire department even when you are away from your house. This early notification can limit property damage, help protect pets even when you are away from the house, and get the fire department responding as soon as possible. Monitored smoke detectors usually provide the maximum discount that your homeowner’s insurance company will provide for an alarm system. Ask your insurance agent about alarm discounts. Cellular backup communicator provides an additional level of security by providing another path of communications to the central station. If you do not have a phone line at your premises or bad weather or tampering makes your phone line unavailable, the cellular communicator will be able to send a signal to the central station. Cellular backup communicator service available in most areas; additional monthly service required. We install Honeywell brand of residential and commercial security systems that we customize to your specific needs. Most security systems include window and door contacts, at least one motion detector, inside and outside sirens, and central station monitoring.